Flower arranging speaks to me. I’ve always wanted to unlock the secret to the perfectly wild-yet-balanced bouquet. It’s something my maternal grandmother has always had a knack for; putting that flower in the exact right spot so that it both stands out and contributes to the arrangement as a whole. One bent branch, one leaf taken away: it can make all the difference. So when the chance to take a flower arranging class was offered by Eva Solo, I jumped at the opportunity. 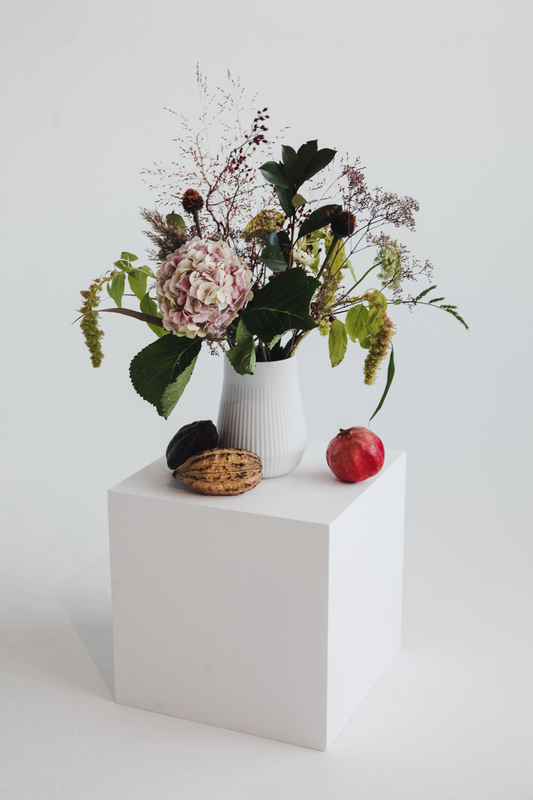 In celebration of their new large vase, Legio Nova, the workshop would teach us to put together our arrangements, as well as how to use the shape of the vase to highlight the stems. 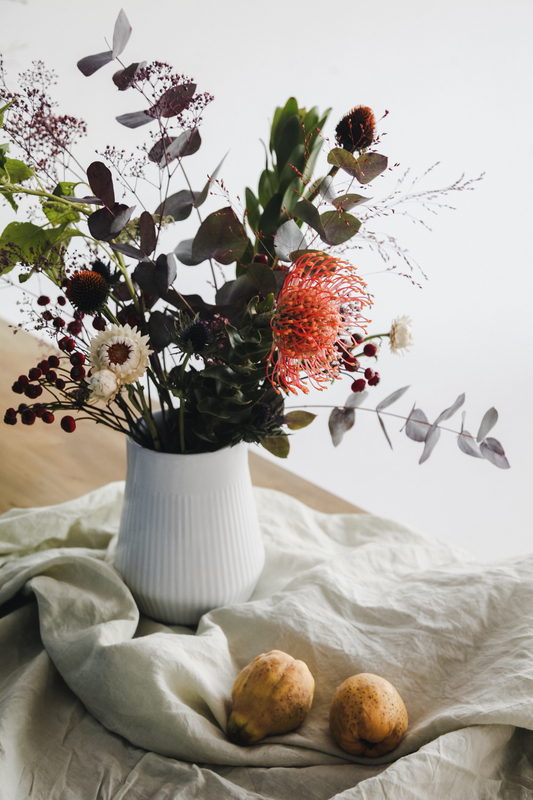 We were given beautiful mixed bouquets of flowers including hydrangeas, Queen Anne’s Lace, viburnum, heather, eucalyptus, and pin cushion protea. There was a variety of textures and heights, but the range of colors was limited to deep jewel tones, mostly reds and purples. 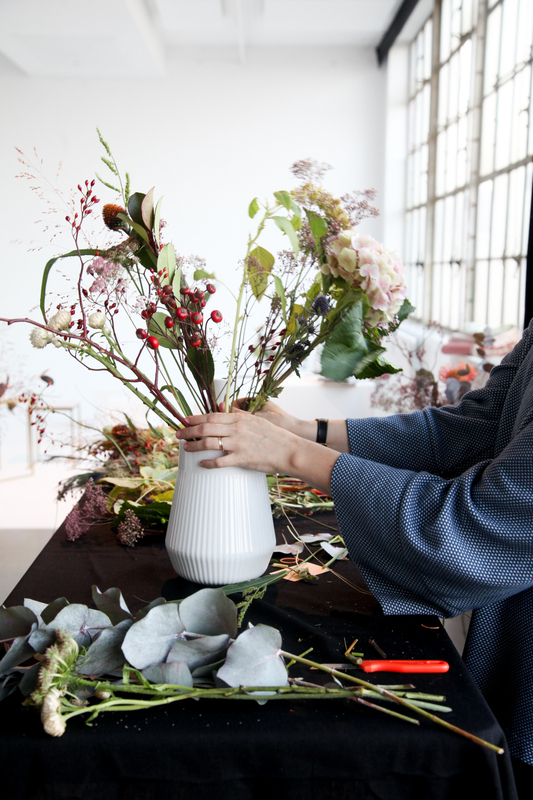 Our floral instructor showed us how to strip the stems of unnecessary leaves; take away anything that won’t be showing outside the vase. Then we gathered the bouquets in our hands, adding or omitting individual stems. Do this one-by-one with the largest flower as your base; I used a hydrangea. Once we had the basic bouquet done, we placed the entire thing in the vase to see how it would look. This changes the shape because we tend to hold the bouquet tighter than the vase does. It also shows you whether you need to trim the bottoms of the flowers. 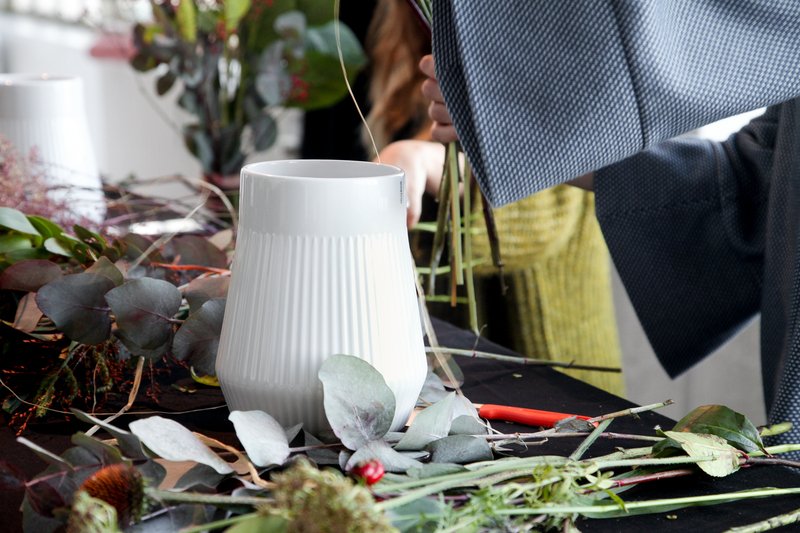 The Legio Nova vase is not too tall, but the mouth is quite wide; this gives you lots of room to add and edit once you’ve put the flowers in the vase. At this point, I added branches of leaves to plump up the bouquet and make it look vibrant. 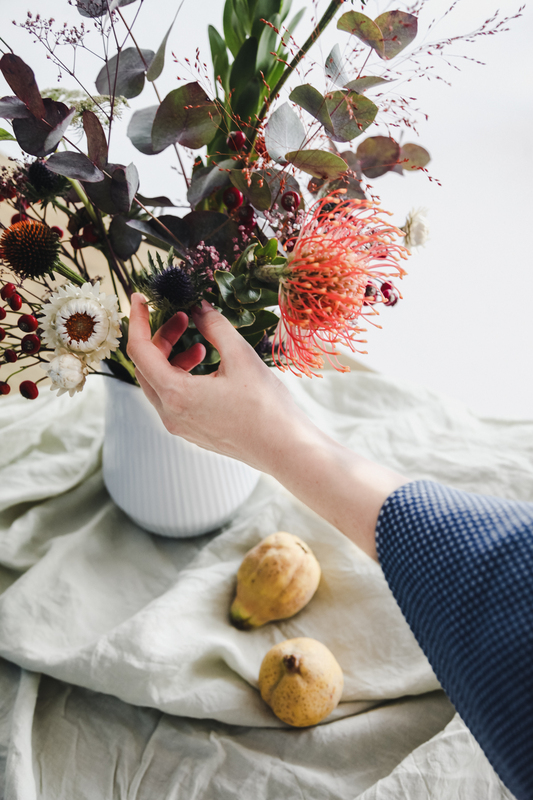 Making sure you have a mix of plants that will dry well (most flowers won’t dry well, so stick to greenery like eucalyptus or grasses like pampas grass). 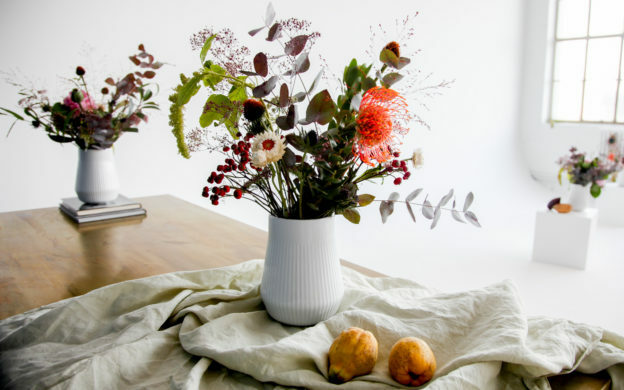 Fresh bouquets should be kept in hot water, as this helps the plants drink best. With the bouquet finished and in its vase, I slowly turned the bouquet 360° and fanned out the flowers and branches, making sure that the bouquet was balanced from every angle. Not to get too Danish about it, but as designer Hans Wegner said, “a chair should have no back;” yes, I apply furniture maxims to my flowers. 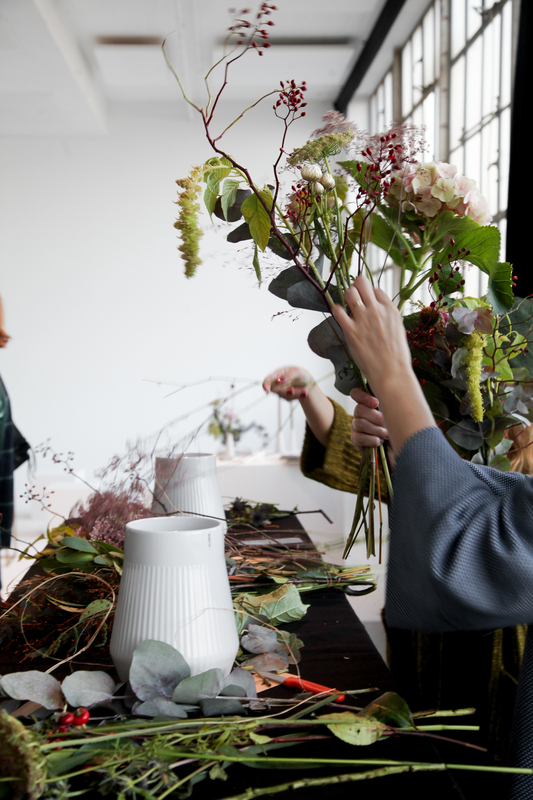 After perfecting the bouquet, we were able to use the studio space at The Lab CPH to style and photograph our work. 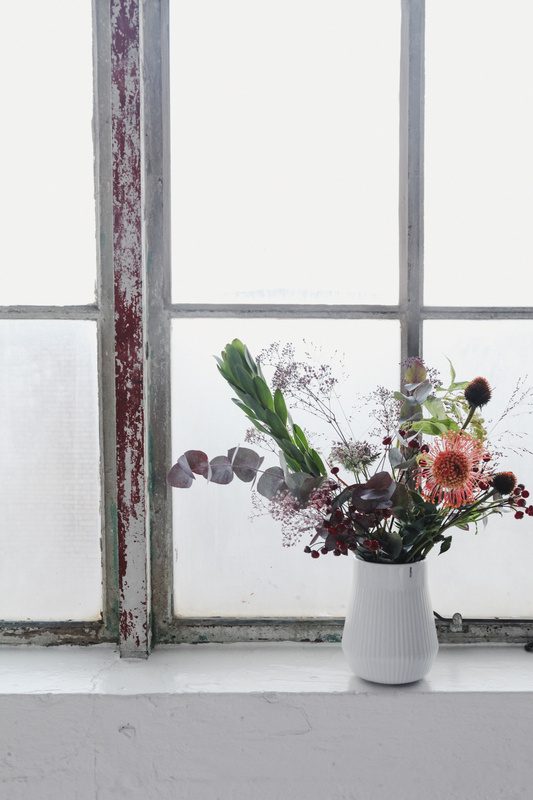 The incredible light paired with the lush bouquets for a truly gorgeous series of photos. 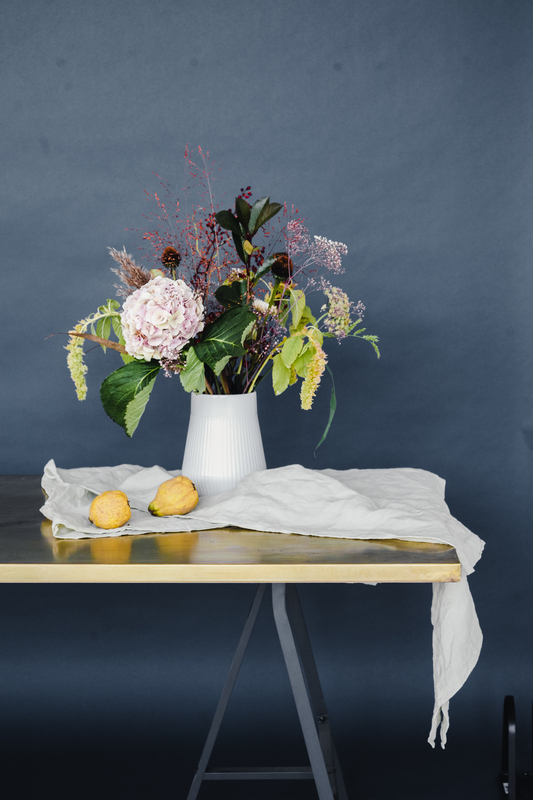 Adding pops of color and texture, such as fabric, fruits, and colorful backdrops, allowed us to really dig into still-life inspiration like the works of Dutch Masters such as Vermeer and van Huysum. 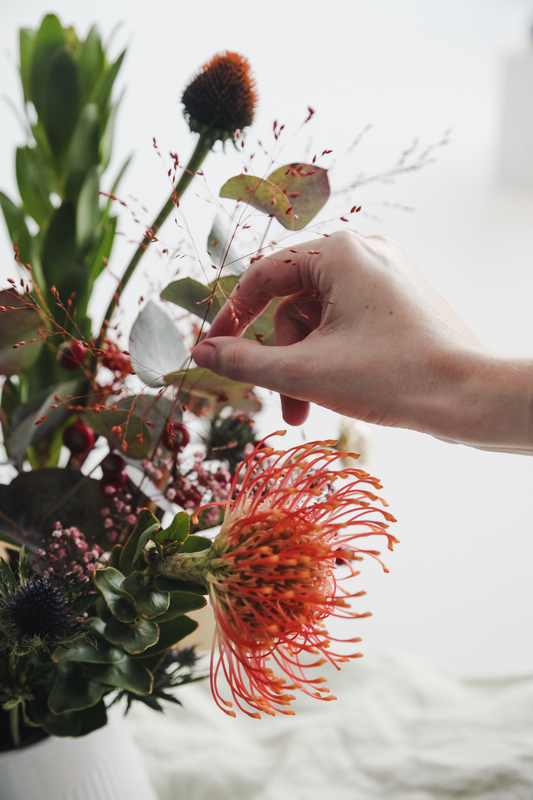 Making something beautiful is always worthwhile; to take part in the process rather than just purchase the final result made me eager to bring flower arranging into my domestic life. It was a moment of joy that made me feel creative and grounded as I interacted directly with the flowers. Having the bouquet at home continued to bring me joy for a full week afterwards. I slowly removed the dying flowers throughout the week, then omitted the water entirely and let the grasses and greenery dry. This resulted in an entirely different bouquet; one that will be around for much longer. 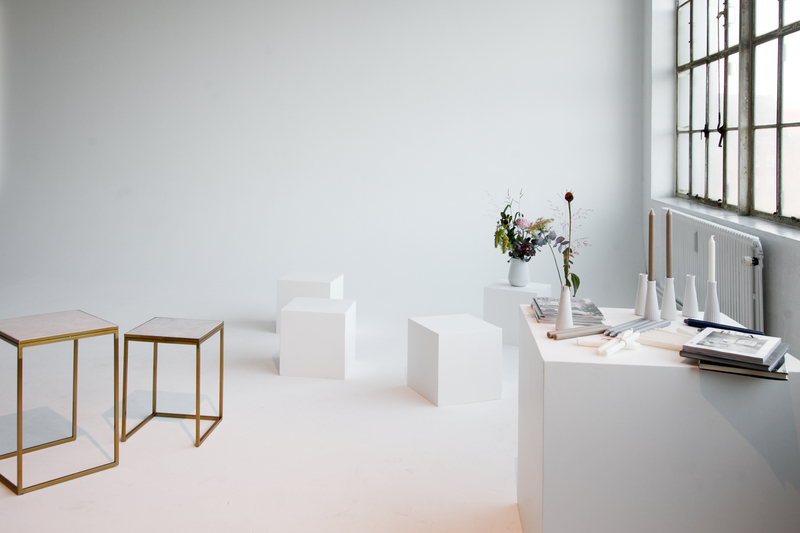 Flowers provided by Blomsterbinderiet Kongsbro and linens provided by LinenMe.